Cabanas are hallmark features of tropical resorts, often seen amid lush palm trees, next to sparkling turquoise waters. But you don’t have to wait until your next getaway to enjoy the benefits of a cabana —get a head start on your relaxation by having SRA Home Products install one in your Newark, Delaware, backyard this season. A shaded spot — After floating in the pool or lying out in the sun all day, you can use one of our cabanas to escape from the sun and enjoy a cooling breeze. A private changing area — Our cabanas feature optional privacy curtains, making them the perfect spot for you and your guests to change into or out of your swimsuits without the hassle of running into the house. A shelter for your hot tub — If your backyard already includes a hot tub, or if you’re thinking of adding one, you can use one of our cabanas to shield the tub from overhead debris. A centerpiece for a luau — If you like to host summer parties, a cabana would be the ideal shelter for your snacks and drinks. The roofs on our cabanas include pergola trim that evokes an island feel that will remind your guests of the tropics. When you’re looking to relax, the last thing you’ll want to worry about is keeping up with backyard maintenance. That’s why our cabanas feature a durable TEMKOR polymer coating that requires almost no annual upkeep. They are also constructed using heavy-duty, fully extruded aluminum, so you won’t need to concern yourself with the risk of deterioration, rotting, or insect infestation. 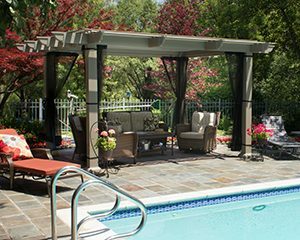 If you’re interested in having one of SRA Home Products’ luxurious cabanas installed at your Newark, DE, area home, please contact us today so that we can begin designing the perfect structure for your backyard.